Archives : X MAS SPECIAL - SANTA RALLY CHEERS THE MARKET - 24/12/2009. SANTA RALLY CHEERS THE MARKET - 24/12/2009. First of all let me wish all my readers a Merry X’Mas and a Very Happy New Year. The year 2009 started with consolidation and accumulation, but after March the market witnessed a strong rally. The coming year 2010, the market starts on a positive note as the consolidation phase is already on for the past three months (since Deepawali). So one can expect a resumption of strong upward rally as witnessed last year. TO READ FULL ARTICLE CLICK "MORE"
Last year there were lot of uncertainties and question marks on liquidity and future growth. But this year the scenario is quite different, the confidence of India Inc has returned as growth has picked up. The global markets have recovered and as a result out markets have also fared quite well. The liquidity scenario is already a thing of the past as can be seen by the record inflows into the capital market and in the way our companies are easily raising funds via the QIP route. The growth is on track and we are on the way to a double digit growth by the end of next year. Both the Sensex and Nifty have formed a Bullish Inverted Head & Shoulder pattern on the weekly charts. The targets for Sensex are 18981 on the lower side and 23488 on the higher side. As far as Nifty goes, minimum target will be 6315 and on the higher side 7104. The above targets will be achieved as long as the Sensex continues to stay above 15600 and Nifty above 4711. If we consider the pattern formation according to Harmonic Pattern set up, where AB=CD, then the target for the Sensex will be 20772 and for the Nifty the target will be 6018. According to the Golden Ratio, the Sensex will have a target of 20450 and Nifty will have a target of 6130. If we consider the immediate targets then both the Sensex and the Nifty have given an Ascending Triangle breakout and the target will be Sensex – 19456 and Nifty - 5824. For the year ahead, Sensex will face Resistance at 18315-20450-23488 and Support will be at 15600-13219-11695. For the Year ahead, Nifty will face Resistance at 5468-6130-7104 and Support will be at 4770-3918-3534. 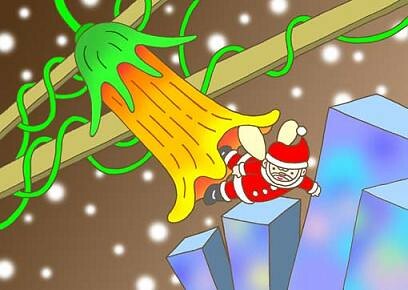 The market got a gift from the Santa Claus in the form of a surprised rally seen last week. The pace and the manner in which the market moved up surprised one and all. The global cues were okay, but our market simply bounced back on basis of short covering. Once again the market has formed strong support in the zone of Nifty 4930-4950. For the current rally to continue this lower support zone should not be breached. On closing basis, both Sensex and Nifty have given an Ascending Triangle breakout. Ideally the Sensex should have closed above 17493 and Nifty above 5182. This formation has been taking place since October and now we can say that it was more of accumulation at lower levels. Both Sensex and Nifty have formed a Bullish Engulfing Reversal pattern on the weekly charts. In the process the Sensex managed a weekly gain of 641 points and Nifty a gain of 191 points. 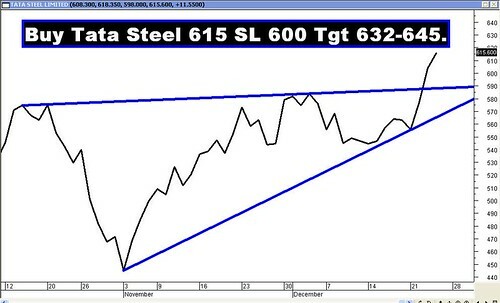 Both Sensex and Nifty have given an Ascending Triangle breakout. According to this formation the Sensex will have a target of atleast 18125 on the lower side and 19426 on the higher side. The short to medium term trend has turned up as both Sensex and Nifty have managed their close above 50dma (Sensex-16827 and Nifty-5005). Both the Sensex and Nifty have crossed the 61.8% retracement of the entire fall. Now both the indices will head toward the 78.6% of the entire fall of Sensex (21206-7697) and Nifty (6357-2252). The level for Sensex is 18315 and for Nifty is 5478. The Trendline support for Sensex is at 17084-16729. 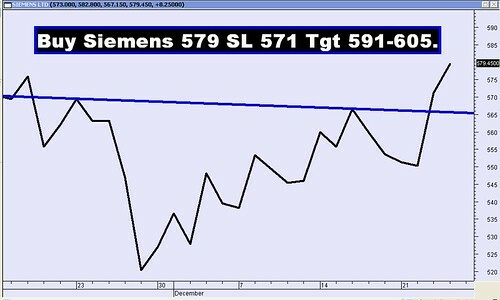 The Trendline support for Nifty is at 5100-4978. The strong surge in the Nifty saw CALL writers covering their short positions and as a result the O.I.PCR has increased in the strike of 5000 for both December and January Series. Hence this level should act as a strong support for the coming week. CALL writing is seen at the strike of 5400 for January series. For the week ahead, Sensex will face resistance at 17497-17735-18125 and will find support at 17098-16820-16577. For the week ahead, Nifty will face resistance at 5226-5298-5368 and will find support at 5100-5017-4943.